Today, The Xcite Group was named by Washington-based B2B research and review firm Clutch as one of the top web design firms for 2016. The research Clutch performed is based on over a dozen quantitative and qualitative factors, including company experience, client list, industry recognition, client reviews, and market presence. 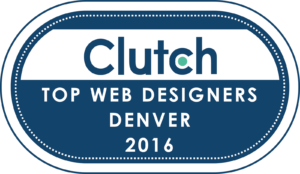 Today, Clutch has published its findings on web design companies located in Denver, Miami and Phoenix. This research leverages Clutch’s methodology, mapping each firm’s focus on web design services against their ability to deliver world-class results for their clients. Clutch has researched and reviewed more than 1000 companies spanning 50-plus market segments. This designation is one that we are incredibly proud of, because it comes from not just Clutch’s third-party evaluation of our work, but also from the satisfaction of our clients. This happens as a result of the hard work and dedication of our entire team and we couldn’t be prouder. Having just entered our fifth year of business, it wasn’t that long ago that Xcite Media was the stereotypical “start-up”, with the founding partners working from a dining room table in one of our homes. Today, we are a team of of over 25 designers, developers, optimizers, account managers, project managers and strategists working out of our offices just north of the Denver Tech Center. We take pride in this recognition because it comes as a result of us holding fast to our core beliefs throughout the last five years. While we custom code the designs of all of our website projects, we use WordPress as the Content Management System (CMS). WordPress has grown to become one of the most powerful and easiest CMS platforms, allowing you to add, change and manage your content. VentureBeat reported that as of November 2015, 25% of all websites on the net utilize the WordPress CMS. Why we use WordPress. Transparency is our core philosophy and it guides every decision. Over the last five years, we have taken a hard look at everything our industry has become, admit where we (as an industry) have made mistakes and take courageous steps to undo those mistakes and reinvent ourselves. This includes being ethical, communicating with our audience in a way that puts our best foot forward, asking for feedback and tracking results. Then we take a look at everything and see what needs to be changed. A business is only as good as the values under which your employees operate. Building a culture and a company based on values takes truth, time and transparency. Offering customers exceptional service and developing employees who care about the customer is our core strength. If a company is open to customers’ suggestions and feedback from its employees, the result is great service. We are proud of the team that makes up the heart of Xcite!